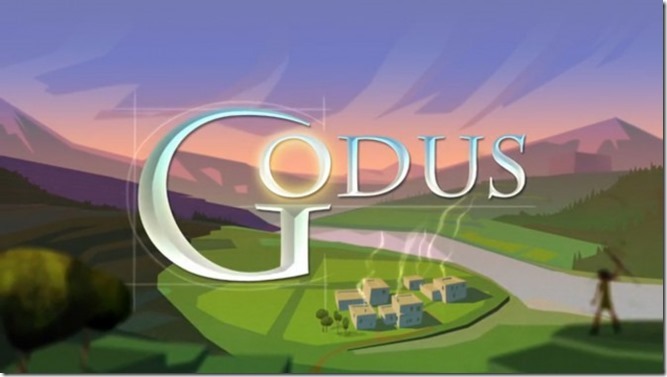 Godus is the new god-game from Peter Molyneux, who invented the genre way back in 1989 with Populous. You start off with a few people on an island. They build huts, and start to believe in you. Their belief shows up as a purple ball floating over their hut. You click on the purple balls to accumulate points (the number in the lower left corner). You use your points on powers (the list on the left side). Reshaping the terrain to help your people cross to new land costs a few points. As your tribe expands you uncover treasure – cards which help your people’s civilization grow. Cards like “Flint” or “Felt”. Find 3 Felt, 2 Flint and 2 Wax cards and you can unlock the “Felt tent” advance, which means your people now build bigger houses, with more people, thus more belief. 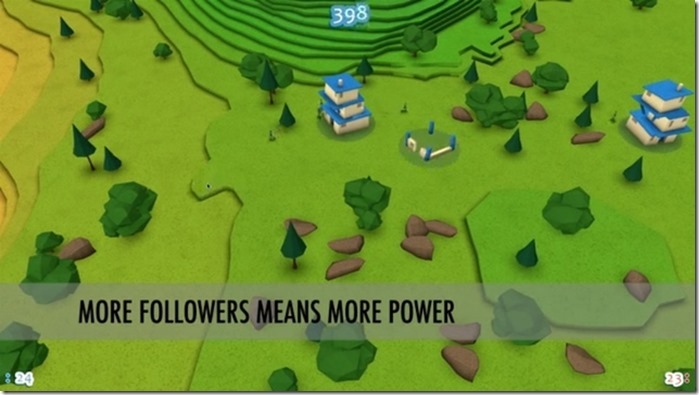 You click more to drag out land to help your people build more houses, so you can get more people and more belief, so you can expand. Soon you have so many people that you have filled up the blue population bar at the top of the screen. A heartbeat announces the near imminent transition, and with a ding and a new card your civilization advances further. You’ve unlocked “Wood Huts”. Bigger houses, more people, more belief. 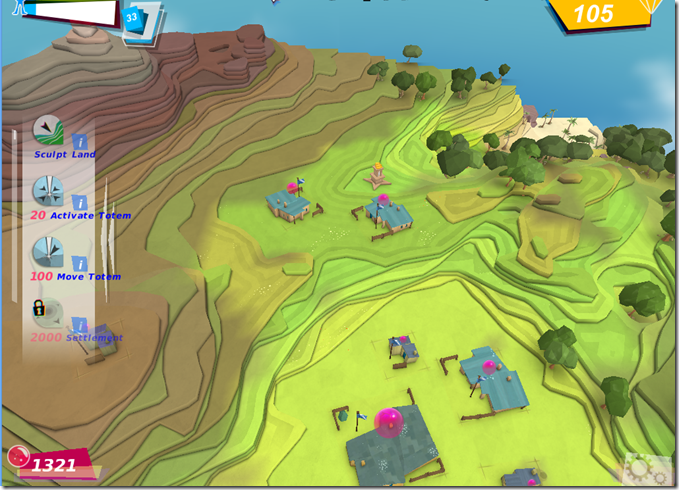 Collect belief by clicking the big purple balls floating all over the houses. Watch your belief score grow into the thousands. Instead of going up by 5 or 25 it’s now going up by 250 or 500 points. Now you have enough points to use bigger powers than before. Do more stuff, move more land. Click more stuff. Chop down some trees. Click click click. Belief points +15. Your people are now numerous enough to refurbish an altar they found in the woods. They work on it and polish it up, and after some time a fanfare, a new card appears and a new area of the map opens up for more reshaping, more clicking and hopefully settlement by your people, who can build and multiply, giving you more belief points (click “bing” click “bong” click “beng” click “bing”). The fact that clicking the purple belief bubbles plays Beethoven one note per click is just icing on the cake. The disappointed raspberry the game blows at you when you fail to play the complete sonata (all 458 notes of it) is a tiny bit annoying at first. Aggravating after a few hours. Soon you are expanding the map in multiple places at once, so if you are bored with clicking on a stubborn cliff-face, you can move over to the old temple you have found and dig it out of the forest so that your people can refurbish it in your honor. And then a new fanfare announces a new expansion, and you are off clicking in a newly opened area, looking for easy settlements and suitable paths for migration. The game feeds you new things to click on at a rate that is just enough to keep you clicking. You can see the nearby areas just waiting to be opened up. You just need a few more people to settle before they can start fixing up the altar to trigger the next expansion. It is frighteningly easy to lose an hour clicking away. The urge to click a few more times before quitting is always there. A click is such a small thing. It doesn’t take much, and then there’s a few more things to click nearby, and that won’t take long. It makes Cow-Clicker seem benign in comparison. Rock Paper Shotgun also worry that it’s more like facebook game than a god-game. The coming update should reduce the amount of clicking needed, but I’m afraid my wife will find my desiccated husk still clicking the mouse button if I try it. 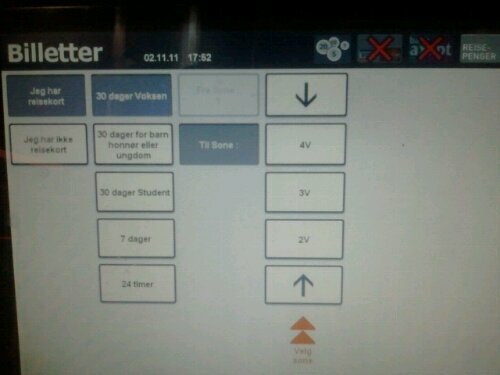 Ruter# has upgraded the ticket kiosks to support multiple zones. The only problem is that the default zone (1) is not visible when you get to this step in the buying process. The column of zones scrolls, although you would never guess this from the user interface. 4V is the name of a zone. The up ? and down ? arrows don’t indicate progress within the steps (the double triangles do this ?? ), they trigger scrolling. When you push the upwards pointing arrow, the list of zones shifts to show more, including the most common choice (1). Not exactly a super way of indicating that there are more choices. Now granted � they are hampered by ELMER � the UI standard toolkit they are mandated to follow. It doesn�t allow for a lot of graphical flourishes in order to distinguish scrolling from standard choices. But really, would it have killed you to put all the zones up using 2 or 3 columns? There�s lots of room on the right side of the screen that�s not being used. Hmm � so I�ve activated a Microsoft product by REJECTing the license. Am I now in breach of the license? Can I be said to have �hacked� the software to make it work? Am I now free to do whatever I want with the files? My darling better half is enjoying her new MacBook � but the Apple �Pages� software turned out to be less popular. 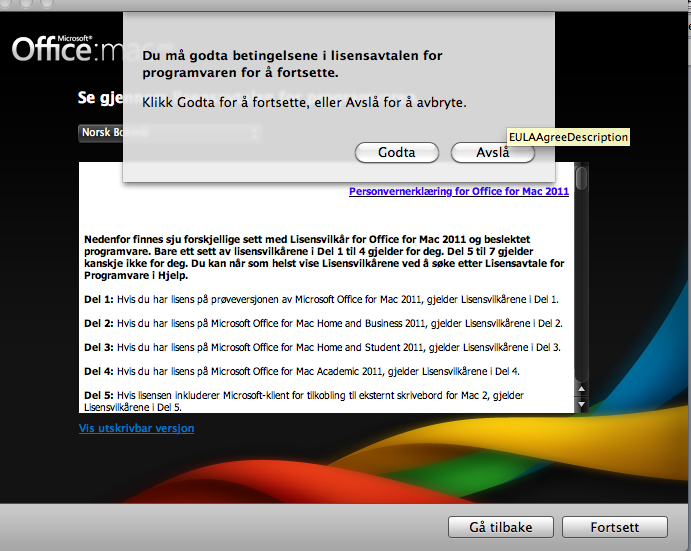 After Jens pointed out to me that I can buy a cheap license for Office through the Home-Use Program, I bought a license and downloaded the Mac Office and installed it. The same dialog, in English this time. This explains why I completely failed to complete registration until I clicked the REJECT (Avsl�) button. The translation team at Microsoft has transposed the labels � making the task impossible to complete unless you disobey the instructions. 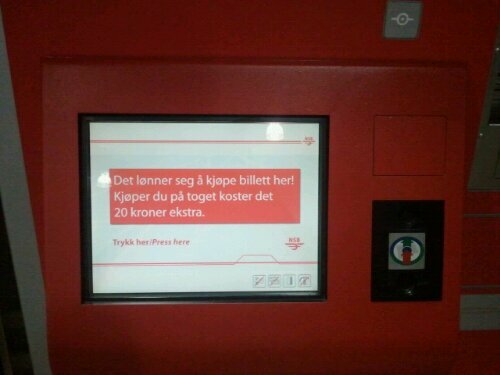 The problem has been reported to Microsoft, so hopefully in the future Norwegians won�t be baffled by the difficulty in activating the software. The confusion probably arises from the MS Windows habit of having the OK/CANCEL buttons in the opposite order from the Mac, which tends to put them in the reverse order: CANCEL/OK. The Android user interface has a few consistency issues. The icons can be moved around the screen by press holding the icon. So far, so like the iPhone, minus the cute shaking. However, the icon shelf at the bottom of the newer Android screens is not so easily altered, at least not on the Samsung Touch UI variant. The icon shelf is not editable from the ‘desktop’ at all. The desktop menu has Edit, but that rearranges the order of the screens. Nothing about the shelf here. Press-hold an icon on the shelf? Nada. Nothing. Press-hold the Home button, maybe? Nope. 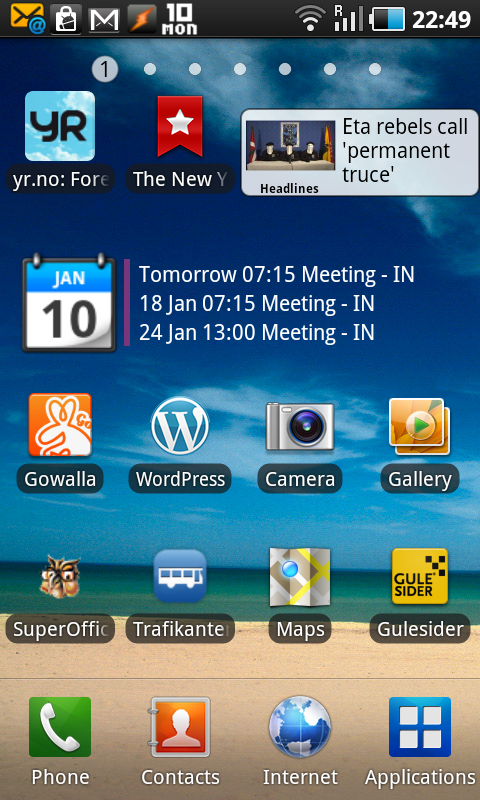 That’s recent apps and the running tasks list. A quick google turns up the answer: the Application program. 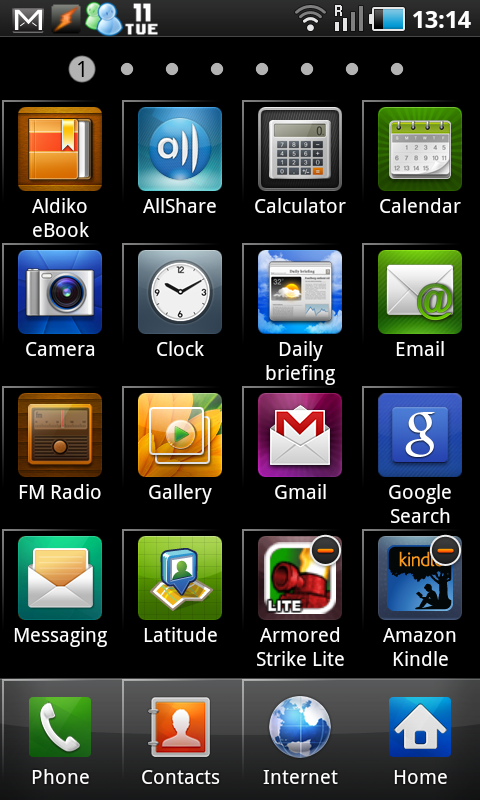 It has an Edit menu that lets you assign apps to the shelf. Except when the applications App is in list-view mode: then the edit menu item disappears without a trace. Once switched to Edit mode, the grid of apps icons turn into buttons, but you don’t press them, you drag them to the shelf at the bottom of the screen. You can also drag icons off the shelf to the apps grid. So we have two different ways of moving icons around: press and hold on the home screens, and drag-drop buttons in a special edit mode in the apps app. More confusing is the involvement of the apps app in the whole thing. The shelf is part of the screens – there is no obvious link to the apps app. A better solution would be to use press-hold on the icons on the shelf, and allow the icons to be moved on and off the shelf in the same way as the rest of the screen. The problem here is that the shelf turns into the trashcan when dragging icons. So how can you drag an icon to the shelf when the shelf disappears as soon as you start to drag an icon? By using a press-hold action on an icon on the shelf to activate the apps app editor. This puts the editor closer to hand, and hides the application app dependency. 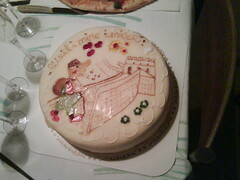 Great Wall cake, originally uploaded by xt1. 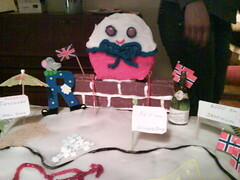 Robert’s mum made this cake, showing the route and the seasons endured along the way. The return of Robert, originally uploaded by xt1. Returned after 600 days walking the entire Great Wall of China. Pixel Qi was something I first read about in an IEEE newsletter, and it gives you a display that’s usable in daylight, and that shows color. Android support means extensibility and fast startup. DivX support and the like. Oh please Santa – bring me one for christmas! First swan of summer, originally uploaded by xt1. 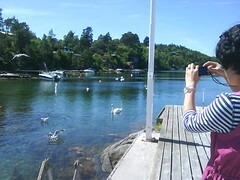 Feeding the swan attracted lots of screeching seagulls.